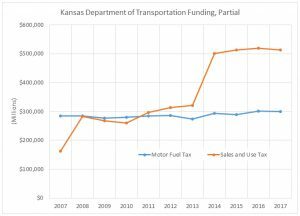 Duane Goossen, former high Kansas government official, says the state’s highways are in trouble. What is his evidence? 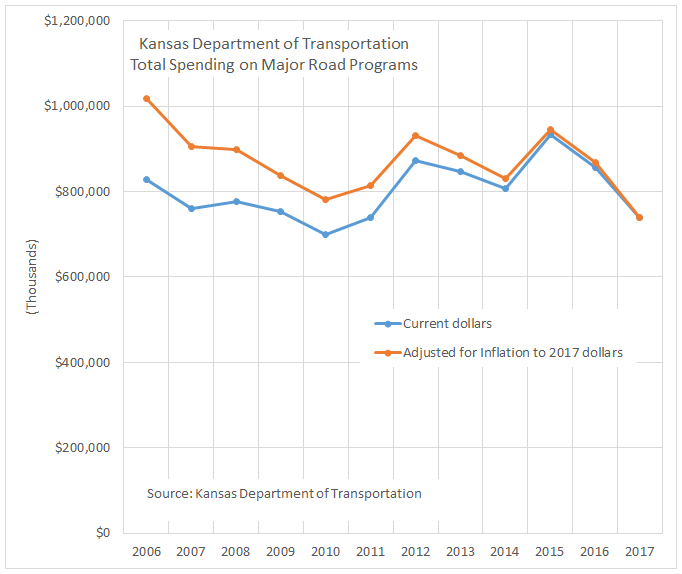 In a recent op-ed, Duane Goossen laments the lack of spending on Kansas roads and highways. 1 His focus is his claimed lack spending on maintenance, which, he says, will lead to much larger repair bills in the future. 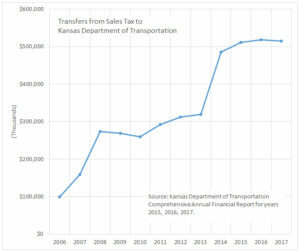 KDOT transfers from sales tax . Click for larger. 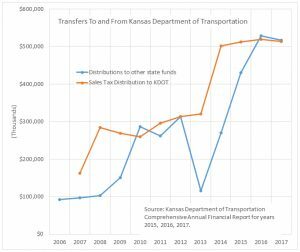 It’s true, as Goossen writes, that a lot of money has been transferred from the highway fund to the general fund. At the same time, the amount of sales tax dollars transferred from the general fund to the transportation fund has risen, and by a factor of five over one decade. 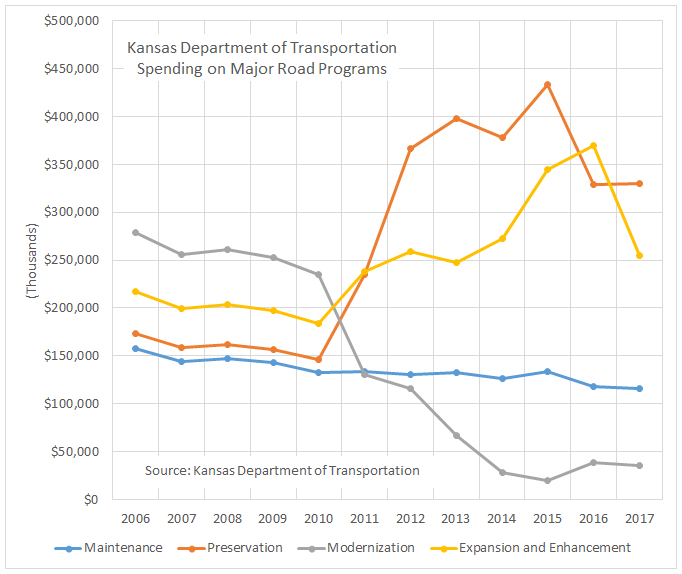 But it isn’t true that Kansas highways are crumbling from lack of spending on maintenance. Here’s a chart of the conditions of Kansas roads and highways. 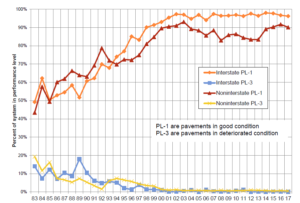 2 It shows that, for interstate highways, the percent of the system in good condition has been pretty level since 2001. 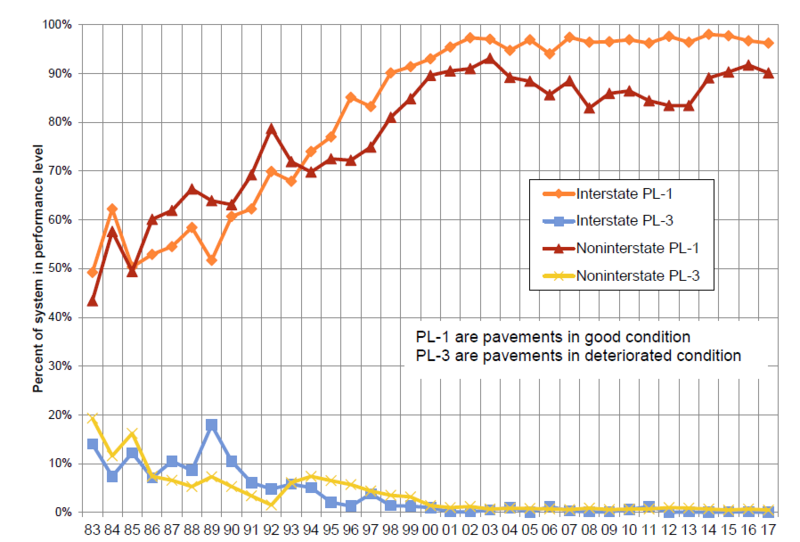 For non-interstate highways, the percent in good condition fell starting in 2004, but has rebounded. 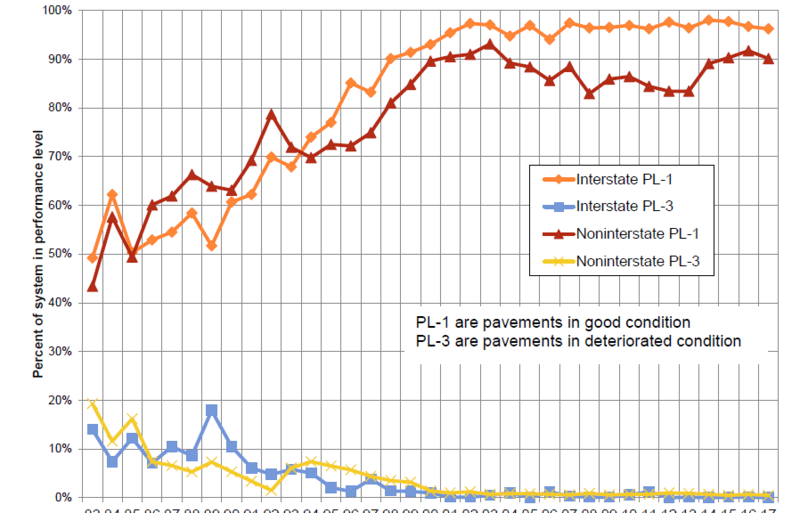 Based on these charts, there’s no factual basis to claim that Kansas roads and highways are deteriorating. But Goossen looks to the future, claiming that a lack of spending now will lead to big bills later. 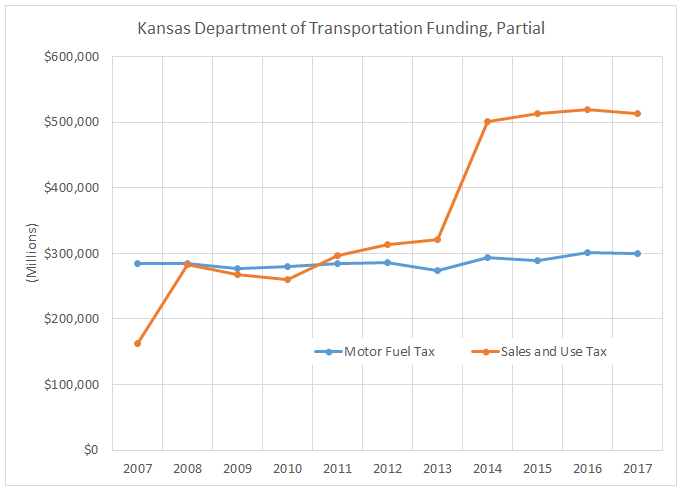 Now, it’s important to know that while money has been transferred from the highway fund, that alone doesn’t tell us about the level of spending on maintenance. 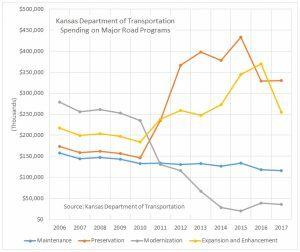 Looking at actual spending instead of transfers to and from, we find that for fiscal year 2017, spending on three categories (Maintenance, Preservation, and Modernization) was nearly unchanged from the year before, while spending on the category Expansion and Enhancement fell by 31 percent. 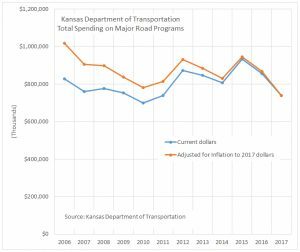 And adjusted for inflation, spending on maintenance programs has declined somewhat, including in the years when Goossen held high office. These declines, however, are far short of setting up Goossen’s prediction of calamity. However: The state also issued “interest only” bonds in 2004 and 2010. 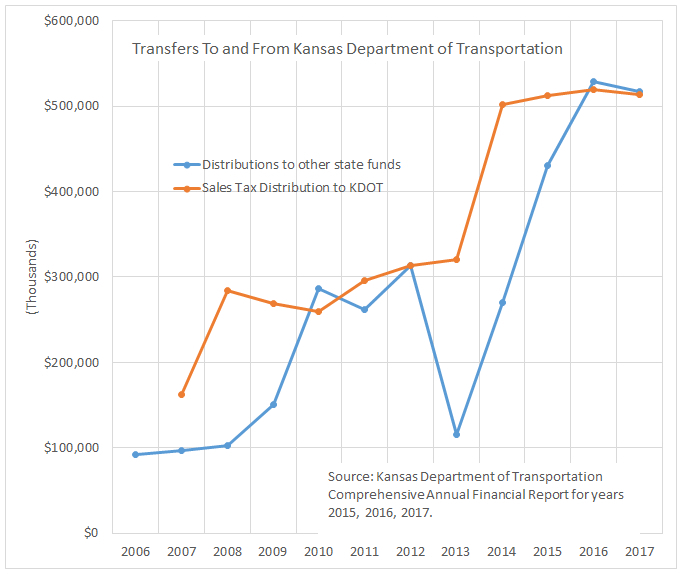 4 Who was budget director during these years, as well as Secretary of the Kansas Department of Administration? Duane Goossen. 5 But now Goossen criticizes as irresponsible the same action the state took when he was in high office. Given the insufficient factual basis for Goossen’s claims — not to mention the blatant hypocrisy — we have to wonder if this article is politically motivated. Perhaps it is, as we see Goossen making the maximum allowed contribution to Kansas Democratic gubernatorial candidate Laura Kelly. Either that, or Goossen is auditioning for another government job. Great reporting Bob! Have you heard Goosen in person? He is incoherent and refuses to answer questions. Thanks for exposing his methods and madness.